There is little doubt the Americans are frustrated by the success of the Syrian army at Deir ez-Zor and are trying to advance their pawns, the Kurdish and Arab tribal fighters toward the east, Peter Ford, the former UK ambassador to Syria & Bahrain told RT. The Russian military has accused the US of colluding with Al-Nusra terrorists, who launched an attack on Syrian army positions near Idlib, inside a de-escalation zone. A small group of Russian military police stationed in Syria was caught in an ambush during the attack. According to the Defense Ministry, the Russian troops managed to repel the Al-Nusra militants, despite being surrounded and heavily outnumbered. Following the Russian military's claim, the Pentagon issued a statement saying the US position on Al-Nusra being a terrorist organization has not changed. RT: The Russian Defense Ministry accused the US of supporting the attack by Al-Nusra on Russian forces. What do you make of this allegation? Ivan Eland: I think the US would have an interest in doing that, but I am not sure that they would really want to support Al-Qaeda in doing this, because they’ve had that experience in Afghanistan when they supported the Mujahideen, and later on these people used the weapons and the support to create Al-Qaeda. I can’t say that it’s not happening because one never knows what the CIA is up to, but I think the US would be reluctant to support Al-Qaeda. They certainly would want to stop the Syrian army from having gains. The Americans have a plan. They don’t want the Syrian army to recapture Deir ez-Zor, which is very close to the Iraqi border. They don’t want to create or to allow some sort of connections or passage between the Iraqi army and the Syrian army in that part of Syria. It seems the Americans would like this border to be closed forever. And they don’t want the Syrians to control Deir ez-Zor simply because it has oil fields, gas fields and also it is a very strategic position. If the Syrian army win the Deir-ez-Zor war, this would be the last war on Syrian territory… Abdel Bari Atwan, writer and commentator, to RT. RT: The US is fighting ISIS near Deir ez-Zor as well. What would be the point in trying to stop the Syrian army's advance? IE: In guerrilla warfare – irregular warfare – the army is stronger. I think the Syrians with Russian help beat this back and I guess there was some local militia involved as well. Any sort of rebels – whether it’s Al-Qaeda, ISIS, or whatever - they are best when they don’t take on directly more powerful people like the Syrian army, the Russian forces, etc. Certainly, what the guerrillas are trying to do is just not lose the war. And if they do that and they keep hanging on, they then hope that these stronger parties get tired and settle the whole mess, or they pack up and go home if they are a foreign power. But there is the possibility of Russia and US forces accidentally clashing, and that rarely happened in the Cold War, the two superpowers tried to make sure that didn’t happen, but of course, they are on the same battlefield in Syria, and they are trying to stay deconflicted, but it still could happen. At the same time, the surrogate forces of the Syrian government and the Kurds and the Arabs could definitely come into conflict as well, particularly if they are fighting over territory that ISIS had previously. RT: It's not the first time the Russian Defense Ministry accused the US of supporting terrorists in Syria, isn’t it? Peter Ford: It will be interesting to see what, if any, proof is brought forward. 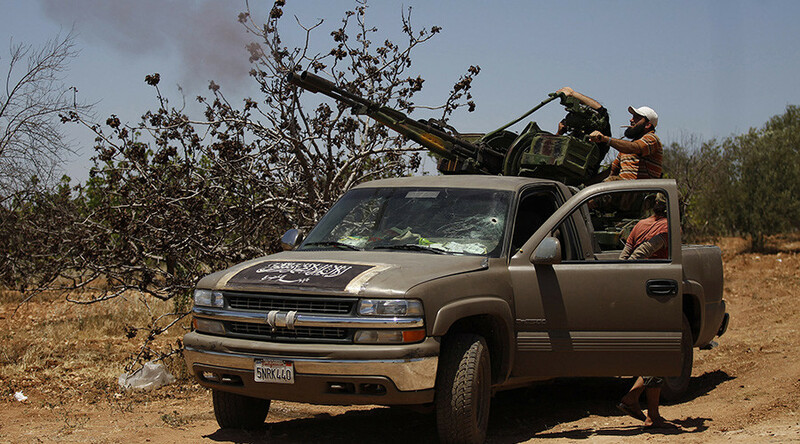 What has just happened in Idlib suggests that the Al-Qaeda affiliate group there – Al-Nusra – is following an American agenda. That can be little doubt that the Americans are frustrated by the success of the Syrian army in Deir ez-Zor and are trying to advance in the game their pawns, their proxies, their mercenaries - the Kurdish and Arab tribal fighters – who are also moving toward the east. The Americans have been frustrated in this, because these mercenaries were attacked a few days ago by Syrian and Russian planes, according to reports. What is happening now in Idlib could be read as the American countermove. They have engineered a move by Al-Nusra, and there have been recent reports of how Al-Nusra has been supplied over the years by the Americans through various intermediaries. They have been prompted to make this attack in Idlib in order to force the Syrian army in the east to divert forces back in the direction of Idlib. RT: What is the significance of this race to the east of Syria? PF: The east is important for two main reasons. One is oil. The largest Syrian oil fields are in the area that has yet to be captured from ISIS. Secondly, the Americans appear intent on doing anything to prevent what they claim would be a land bridge for Iran from Teheran, through Iraq across eastern Syria into the Mediterranean. That is the fantasy land of course, but this part of the American intentions, and why they are frustrated because it was the Syrian army that has begun to move east of the Euphrates. To the Americans, this is in contravention of an alleged deconfliction zone. Again, this is fantasy land; this has never been agreed. The attack by the Russian air force on the advancing Kurdish mercenaries signaled very serious intent on the part of Russia. It signaled that Russia will not back down, even if it means confrontation with America. America’s credibility is not as much on the line as Russia’s… In this game of bluff and counter-bluff, I think the Russians are giving a master class in game theory, and they will prevail in what some have called the ‘wild East’ of Syria. The Americans think they understand the ‘Wild West,’ but this is different.